While birth defects are not new, I have to admit I have never seen a baby with 2 faces. 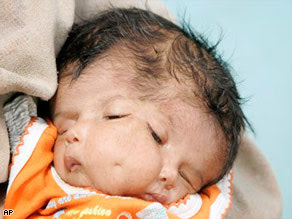 Born a month ago in an Indian village, she is being hailed as the reincarnation of a Hindu goddess. This rare condition is known as craniofacial duplication where her eyes, nose and mouth are duplicated. Doctors have examined her and deemed her to be in healthy condition. A CT scan was suggested to ensure that her internal organs are fine but the father declined it, saying his "daughter is behaving as a normal child". She drinks out of both mouths and blinks all 4 eyes at the same time. Here's hoping she lives a healthy life.